Eating healthy makes good sense and doesn't have to take a lot of time. One of my favorite dishes is a dry rub roasted salmon that makes its own glaze. Roasting a salmon filet is perfect for a family meal, NFL game day or a party entree. For a pot-luck dinner last weekend with friends, I made roasted salmon and a Little Gem lettuce salad with carrots. Healthy, nutritious and delicious and oh so easy. 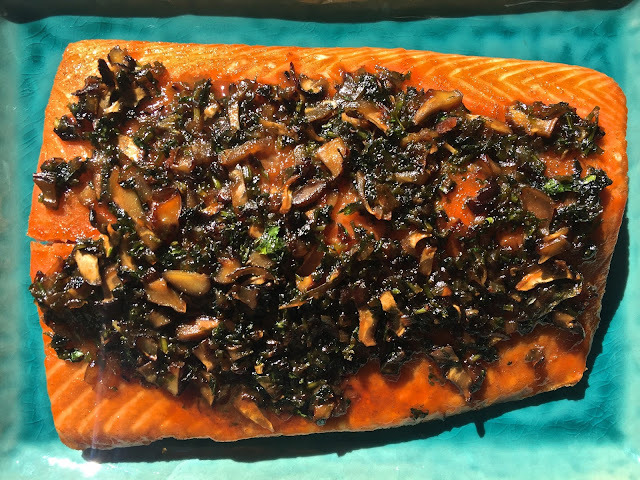 To get the salmon from refrigerator-to-table, all I needed to do was season the filet with dry rub and place it in the refrigerator. Overnight the mix of sugar, salt and aromatics drew moisture out of the fish. 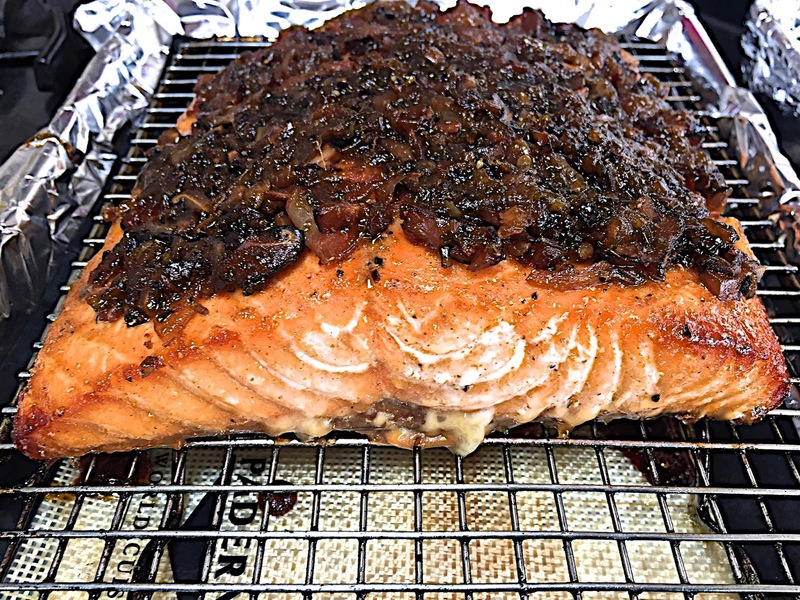 The dry rub turned into a wet slurry that became the base for a sweet-heat savory glaze. The filet takes 30 minutes to cook in the oven. The glaze takes 5 minutes to cook in a saucepan. 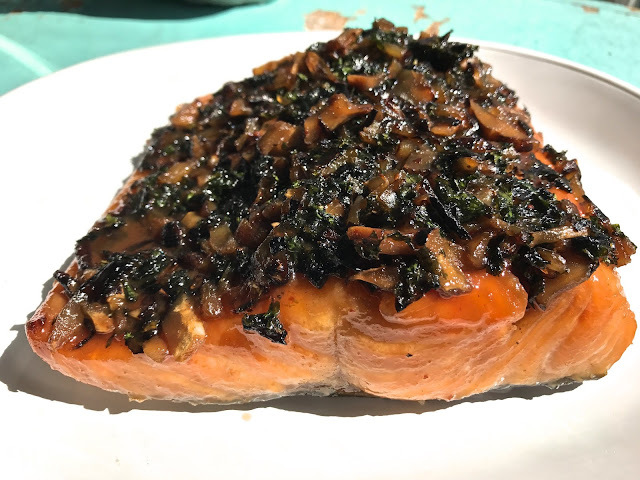 Because the salmon is best served at room temperature, the dish can be cooked ahead of time and served when everyone is ready to eat. Which makes it ideal to make ahead when you know you will be busy before the meal. 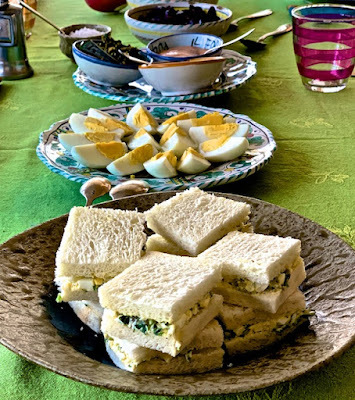 For brunch, the salmon can be served with toasted bagels and cream cheese and with scrambled eggs. For lunch, dinner or watching a football game, add a green salad and pasta and you have an entire meal. Adding tomato sauce to the glaze mellows the flavors. You can use canned tomato sauce but making your own will taste much better. 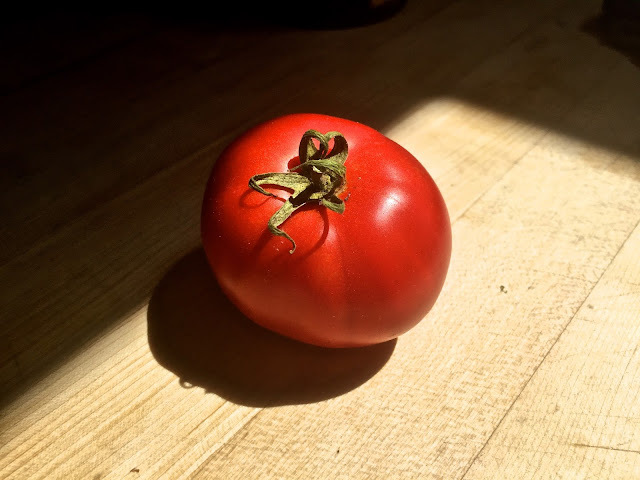 Roasted tomato sauce is so easy to make, I would encourage you to make a lot and freeze the sauce in 6 ounce air-tight containers. That way, when you want to make a pasta sauce you will have roasted tomato sauce in the freezer. Preheat oven to 500 F. Remove the stem from the tomato. 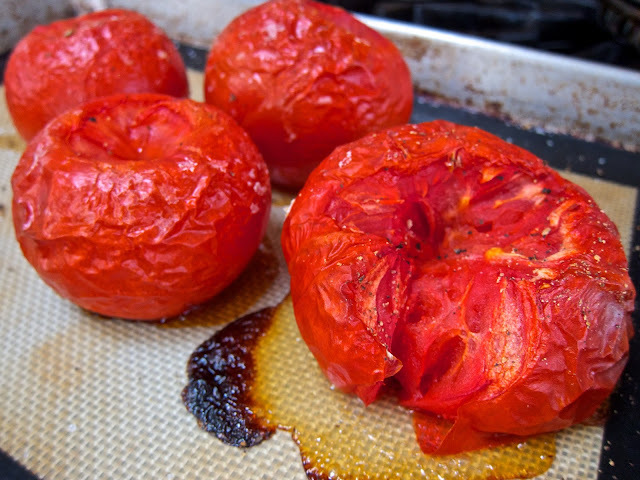 Place the whole tomato on a Silpat sheet or parchment paper on a baking tray. Roast 20 minutes. 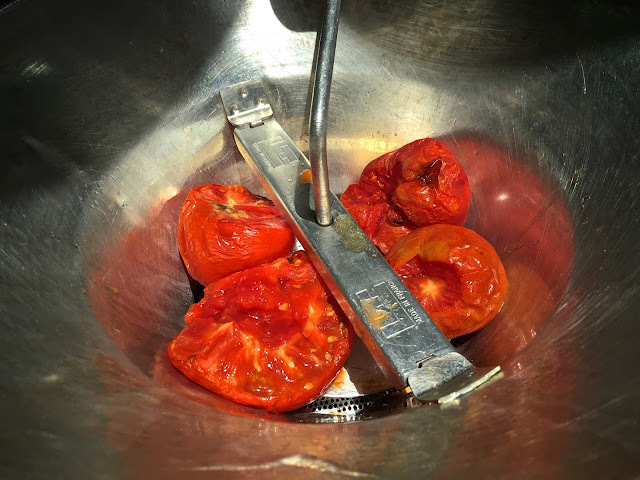 Transfer the tomato and any juices from the baking tray into a food mill or a fine mesh strainer. Press the tomato to collect the juices and pulp. Reserve skin and seeds to make vegetable stock or discard. Set tomato sauce aside or refrigerate in an air-tight container. The sauce can be frozen if made ahead. Inspect the filet and remove any bones. Trim off small fins if there are any and discard. Pat dry. In a bowl, mix together the dry rub seasoning. Measure a piece of plastic wrap that it is longer than the filet by 5" on all sides. Lay the plastic wrap on a flat surface. Spread half the dry rub on the plastic wrap. Lay the salmon filet on top, skin side down. Spread the remainder of the dry rub on the salmon. Fold over the ends of the plastic wrap so the salmon and dry mix are pressed against each other. Put the package into a plastic bag and seal. Place the plastic bag on a baking sheet in case of leaks. Refrigerate. The next day, remove the salmon filet. The dry rub will have become a wet slurry. To make the glaze, place the bag in a bowl. Remove the salmon from the plastic bag and plastic wrap being careful to capture all the liquid. Use your hand to scrape off any dry rub that clings to the filet or the plastic wrap. Mix together any remaining dry rub and the wet slurry. Line a baking tray with aluminum foil and place a small wire rack on top of the aluminum foil. Place the salmon filet on the wire rack, skin side down. Place in the oven. In a small sauce pan, heat olive oil and sauté onion, mushrooms and Italian parsley or kale until lightly browned. Add dry rub slurry and roasted tomato sauce. Mix well. Simmer 5 minutes. Set aside. After the salmon has been in the oven 20 minutes, remove. Place a generous amount of the glaze on top and return to the oven another 10 minutes. Reserve any extra sauce. Remove from the oven. When the salmon is cool enough to touch, use a pairing knife to help remove the filet from the wire rack. Keep the skin on the filet. When transferring the salmon to a decorative plate, be careful not to disturb the toping. Serve at room temperature with the extra sauce in a small bowl.